My plate of collared greens, cornbread and two kinds of casserole still minutes away, I had only the glass of sweet tea to feebly distract me from the table to our immediate left. Darnell, a young black man, had emerged from the kitchen, cleaning supplies and all, at a popular diner in downtown Oxford, MS–much to the delight of the middle-aged white woman I’d only been vaguely aware of thirty seconds prior. I had previously noticed the man who turned out to be Darnell. He’d looked tired, even bored–but now his expression looked intimately familiar, as though he’d studied my face to learn its proper form. As the woman talked excitedly to him and introduced him to her group, tears approached my eyes. Her warmth and her friendliness reminded me of my now-deceased mother, and, at first glance, showed how far America has come from the days of Jim Crow. Fifty years is a long time, I thought. And then I kept looking–at the woman, at her table, at Darnell, at the patrons in the restaurant, at our nation–and the question, sitting everywhere and waiting to be acknowledged, found me. How long, really, is fifty years? I left Denver Monday morning, June 2, with my friend Jen. We stayed a night in Oklahoma City before driving to Arkansas and beginning our tour through the South. Jen and I–twenty-somethings, a white woman and a black man–started with a pretty specific itinerary and ideas about what we’d find. Over the ensuing thirteen days, we walked through parks and museums, looked at statues and rivers, and wandered small towns and big cities. Our reasons for going were complementary yet not identical, which worked for us. I grew up “southern-ish,” spending my first fourteen years in the Houston metro area and my college days at the University of Missouri. Living in Denver and Boston helped teach me that neither the history of racial discrimination nor its present effects are limited to the South. Yet I suspected that I might find in Montgomery and Birmingham answers, and questions, that I wouldn’t find in Houston or Columbia. And so we journeyed. The question–how long is fifty years?– proved omnipresent. We didn’t need to travel the South to know this, but even so: America has changed. A young black man and a young white woman toured the South without major incident. We clicked with a white historian at the Rosa Parks Museum in Montgomery and danced to an unforgettable cover of ‘Proud Mary’ with an integrated, middle-aged crowd on Beale Street in Memphis. We toured famous black Baptist churches, large UU congregations, and worshipped at a black Bible church. We walked the elaborate, glitzy National Civil Rights Museum in Memphis and stood alone in Money, Mississippi, at the marker where Emmett Till was abducted and killed in 1955. We stayed with a white mentor of mine in Oklahoma City and a black mentor of mine in Little Rock. We took photos for white families in Athens and black families in the Smokies. We stayed with a black rower in Clemson and a white basketball stud in Atlanta. An older white woman offered me a tissue as I teared up inside the elder King’s Ebenezer Baptist Church. And fifty-two years after James Meredith overcame a violent scene to become the first black student to enroll at Ole Miss, Jen and I sat in the Oxford, MS diner with white and black Ole Miss football players eating together on one side of us, and, among others, the woman who so liked Darnell on the other. I looked at Jen and knew she, too, had her eyes on the scene. We’d found it: the personification of post-racial America. Then I shook my head and looked around. Patrons filled nearly all the restaurant’s tables, yet the only visibly black folks in the place were Darnell, myself, and an Ole Miss football player. I again looked at Darnell’s face, and again registered the familiarity of his facial expression. His expression was a mask, a mask I put on too often. At once, I understood: fifty years is a long time, but it’s not long enough. The 1965 marches from Selma to Montgomery did not start right at the Edmund Pettus bridge in Selma, famously the site of Bloody Sunday. They began less than a mile away, at Brown Chapel A.M.E. church. The demonstration that led to the most important advance in civil rights for millions of Black Americans began here March 21, 1965…This is a tribute to those who planned, encouraged, marched, were jailed, beaten, and died to change Black Americans from second class to first class citizens. Brown Chapel stands in a mostly black housing project on, predictably, MLK Street. The walk hundreds made for freedom fifty years ago is now littered, metaphorically and otherwise, with evidence that the march both lifted millions up, and left millions behind. So many of us in suburbia grew up looking at pictures of the Brown Chapel steps in textbooks. Freedom was won there, we were told. The view out from the steps narrates a far more complex tale. 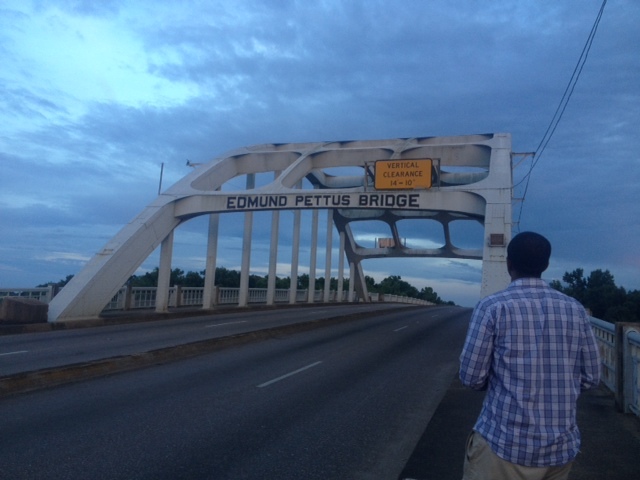 We walked silently from the church steps down MLK Street, past the James Reeb memorial and over to the Pettus bridge. Walking over the river and under the bride’s infamous sign, the font unchanged in fifty years, brought me more than goosebumps and tears. Darnell’s mask–my mask–swam to the front of my mind. The mask and the shoddy neighborhood surrounding Brown Chapel; the bridge and the simplistic tale of civil rights permeating our country’s racial discourse; my own racial frustrations and the disdain some people in my life have for me whenever I mention them–everything felt connected. We grow up being told that racism is a matter of the mind and heart. Being racist is an individual action. Racists are somewhere, and someone, else. Racism, and racists, are mostly a thing of the past. And we grow up learning that Rosa Parks and Dr. King challenged white folks’ hearts and changed them. It’s clear that things are different, and we must acknowledge that. 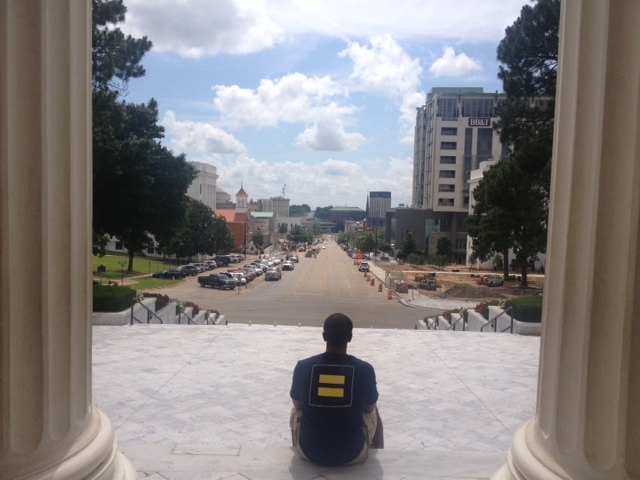 Jen and I can travel together, tour SEC campuses together, and sit on the steps of the Alabama state capitol together. Fifty years is a long time. Fifty years has gotten us here: to the mask I saw on Darnell and know well myself. We are welcome, conditionally. We’re welcome in mainstream society, and welcomed, if. We’re welcome if our diction is like mine. We’re welcome if we smile a lot. We’re welcome if we don’t show anger. We’re welcome if we assimilate, if we don’t speak up too much or talk too loud. So many black folks are never given the tools to learn or the education to make it, and then people ask why they never made it, why they won’t do anything with their lives. The next fifty years won’t automatically bring improvement. Contrary to popular belief, racism won’t end “one funeral at a time,” as ‘old racists’ die off. The next fifty years won’t be about the racial prejudice in our hearts or in our minds. The next fifty years will be about the racism in our policies, in our housing laws, in our school zones. Most of us don’t hate each other anymore–we just don’t know each other. We don’t understand each other. And as someone who spends a lot of time as the only black person in spaces, I wear a mask. I wear a mask that talks sports and The West Wing, 90’s TV shows and Star Wars. My mask smiles often and patiently explains why something hurt me. My mask loves ultimate and doesn’t mind that I’m one of a handful of black players. My mask isn’t a lie, but it’s far from the whole truth. I wear the mask to hide my loneliness, my weariness at always sticking out, my sadness that my attempts to change things get cast as race-baiting or ‘holding onto the past.’ I wear the mask to get along, to get through the days and weeks. I wear the mask because, in a strange way, it’s comfortable. I know it well, and it knows me. The mask, which some black folks know well and I suspect Darnell at Ole Miss had on, gets to come off sometimes. It comes off when I talk with a handful of friends, most of them black. It comes off when I call my Aunt Michelle, a professor in California. And it came off in Selma, halfway between Brown Chapel and the Pettus Bridge, as I wept in front of the memorial for Rev. James Reeb, a white Unitarian minister who was killed trying to help the march. What we have to fight–redlining, police brutality, microaggressions, sexism, educational inequality, mass incarceration–it is different from what Rev. Reeb and others battled. It may feel less urgent to many. Kneeling in front of Reeb’s marker just steps from the Bloody Sunday bridge allowed me to feel my purpose. In my own way–with patience and clarity and love of all people–I am supposed to continue the struggle. I am supposed to continue the march. Luckily, there are plenty of people from all races and backgrounds, gender identities and personality types, who are already walking. Just how long is fifty years?